Unlike traditional lamp based projectors, LS800HD is designed with laser phosphor technology which provides virtually maintenance-free usage for a lower overall total cost of ownership. Packed with 5,000 ANSI Lumens, LS800HD projector is guaranteed to produce high brightness suitable for large spaces with high ambient light. LS800HD’s built-in HDBaseT receiver is able to transmit uncompressed high resolution audio and video at a lengthy distance (100 meters for 1080p and 70 meters for 4K2K) when combined with a cat5e/cat6 cable and is compatible with any certified HDBaseT transmitter. With an advanced cooling design, LS800HD enables 24/7 operation without degradation of quality or performance, making the projector ideal for applications that require continuous projection. 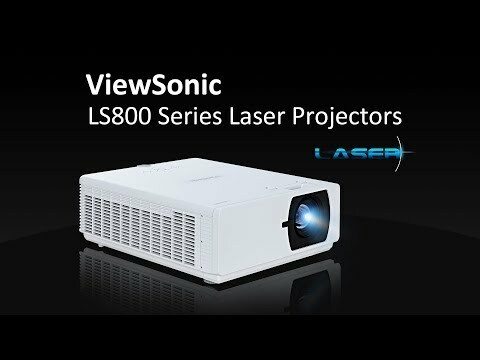 LS800HD is the first ViewSonic projector compatible with Control4 network management. The projector is also Creston, AMX and vController compatible for easy-to-use network management. Image size: 50" - 300"